8:30 a.m. - 1:30 p.m. This event is free, however RSVP is required due to limited seating. To RSVP, visit http://www.cmsdca.gov/index.php/media-news/citizens-environmental-protection-academy. 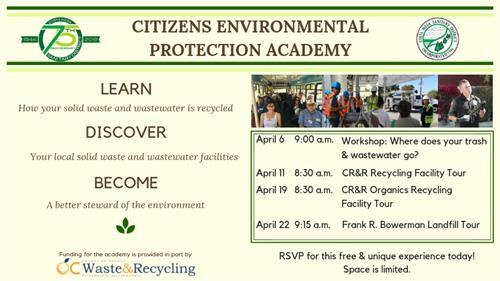 If you would like to be placed on the waitlist, please contact CMSD at (949) 645-8400 or visit http://cmsdca.gov/index.php/media-news/citizens-environmental-protection-academy. Presented through the Citizens Environmental Protection Academy, this is a tour of CR&R's state-of-the-art Anaerobic Digestion facility in Perris, CA where CMSD's yard and food waste is recycled into renewable natural gas and mulch. Lunch will be provided for this tour. Attendees must be 18+ years old, per CR&R policy. Round-trip transportation will be provided from CMSD's headquarters (290 Paularino Avenue, Costa Mesa) to CR&R's Anaerobic Digestion Facility.